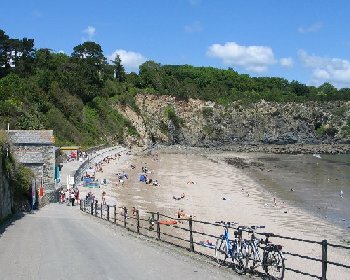 Porthpean is a popular sandy beach with rock pools, very busy in late summer. Facilities are close to the beach. Access to Porthpean Beach is via a slipway. Dogs are banned on Porthpean Beach from Easter Day to October 1. Porthpean is close to St Austell. Approach St Austell on the A390 from east or west and drive round the outskirts of St Austell. Between ASDA and the Mount Charles roundabout on the A390 turn onto Porthpean Road, this is signposted to Porthpean and Du Porth. Proceed on this road and take the second left (signposted to Porthpean Beach) which leads down to Porthpean Beach. 1 small car park close to Porthpean beach.